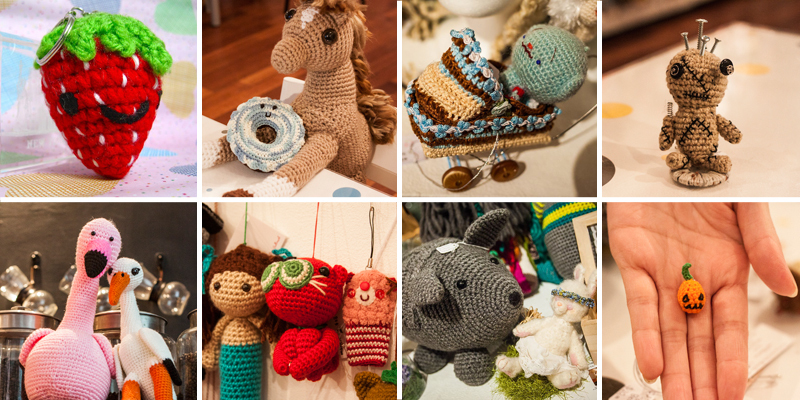 Join the RESOBOX community of crocheting, knitting, and amigurumi-making! You can bring your own project or work on the weekly project. All levels of experience are welcome to join! There is NO class fee but there is a ONE DRINK MINIMUM. Inspired by the amazing response to our first World Amigurumi Exhibit, RESOBOX has decided to hold its own crocheting and amigurumi-making group. This group holds weekly meetings on Tuesdays from 7:00 PM until 8:30 PM at RESOBOX Gallery where crocheters and amigurumi-lovers of all experience levels are encouraged to learn from one another and create things together. Everyone who joins this group is welcome to work on their own projects, but Jing (RESOBOX’s crochet and amigurumi instructor) will be available during the meetings to help and answer any questions. She will also be leading an amigurumi project each week for those who don’t have their own project to work on. All experience levels (and ages) are welcome to join this group, and we encourage advanced and intermediate crocheters to help the beginners. There is no class fee to join this group! However, there is a one drink minimum. Please check RESOBOX’s cafe menu for a full list of the delicious drinks we offer. And don’t forget to join the RESOBOX Crocheting & Amigurumi Making Facebook Group to stay up to date!